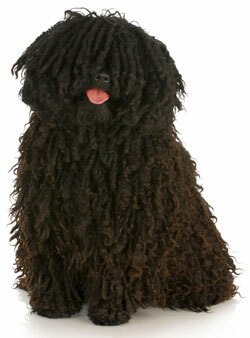 The Puli is an alert, high-energy, athletic, playful, bouncy, loving, loyal dog. He is hardy and confident, and quite serious about his role as a protector of the house; yet at the same time he's a fun-loving, sweet-natured companion who is sensitive to your moods and extremely affectionate to those he loves and knows. He makes an excellent watchdog because he is naturally suspicious and protective of his family and territory. He is wary but usually controlled and unaggressive toward strangers, although he will bark and may lunge warningly if he feels his owner is threatened. He generally keeps his distance from newcomers until he is certain they pose no threat. He can be loud and expressive, and may sometimes bark too much. You can train him not to do this if you give him opportunities to meet new people while he's still a puppy. He is a fairly easy dog to train and a generally obedient pet, although he can be stubborn and does have a mind of his own. He may try to get what he wants instead of doing what you want! If given firm and consistent training he excels at dog sports like agility and obedience trials. For the most part he simply wants to play tricks and have fun, and he keeps his puppy-like joyfulness, curiosity and energy all his life. He needs a great deal of exercise and physical space. He is quick, agile, and loves to run and change directions almost instantly! He doesn't make a good apartment dog, and he can't be left alone in a yard. He resents being ignored, and if bored will become destructive. He needs long daily walks with you and chances to bound and run in a protected area. When outdoors, he should always be on a leash or on safely enclosed land, as he may chase after cars and small animals. He is variable with other dogs and pets, sometimes good with them, and sometimes aggressive. You will need to be cautious and raise him with other pets from puppyhood. He is a helpful, family-oriented dog who loves to play with kind, responsible children, but he is not good with very young ones as he may be too rough with them and try to herd them and nip at their heels. He practically doesn't shed, and so would be a good pet if you like your home neat and tidy. The Puli is 15 to 18 inches tall (to shoulders) and weighs 20 to 35 pounds. He has a double coat consisting of an outer coat that is wavy or curly (and which turns into cords as he becomes an adult), and an undercoat that is soft, thick, and woolly. His coat color can be gray, black, rusty black, or white. Brushing for 10 to 15 minutes or more daily. The Puli has been used as a sheepdog in his native country of Hungary for over 1,000 years. His corded coat is unique in the dog world, and was developed to protect him from harsh conditions while he herded. In the 17th century other sheepdogs began arriving in Hungary and interbred with the Puli, nearly driving him to extinction. An effort began in 1912 to revive the breed in Hungary, and by the 1930's the Puli was being brought to the United States to improve herding on American farms. He was admitted to the AKC in 1936, and the Puli Club of America was formed in 1951. His AKC popularity was 141st out of 157 breeds in 2007.